Crane manufacturer SENNEBOGEN in Lower Bavaria recently expanded its range to include the SENNEBOGEN 9300 E, a modern mobile harbor crane with a reach of 40 m and convenient safe working loads of up to 90 t. As demand grows, the newest machines are delivered to customers in ports worldwide at the beginning of 2019. During the bauma fair, SENNEBOGEN will present the current generation of the 9300 E on its company grounds in Straubing. As a mobile harbor crane, the SENNEBOGEN 9300 E is designed for the demanding handling of general cargo and bulk goods. The machine can be operated using either 2 ropes or 4 ropes. The concept behind the mobile crane represents an interesting solution for a many ports, as its performance data covers a wide range of operations. With a working radius of 40 m, the crane can handle bulk goods for ships up to the Panamax class, as well as containers for standard and feeder ships. At the same time, with a safe working load of 90 t at a working radius of almost 20 m, it is an attractive solution for handling heavy loads and general cargo. The elevating cab is particularly impressive. Elevated to a height of 21.2 m, the operator has an ideal view from his comfortable and spacious Portcab harbor cab. The ascent is made even more comfortable, as the operator steps into his cab at a height of just under 9 m and can be comfortably lifted to the ideal working height by means of the Skylift 1100 cab adjustment. 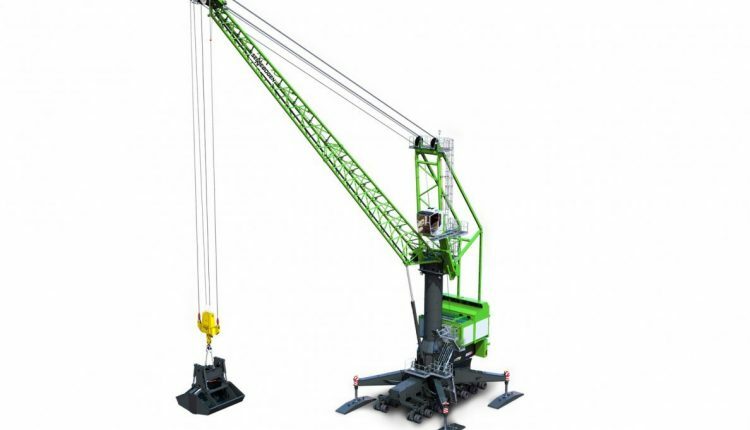 When it came to the design of the mobile harbor crane, special attention was paid to ease of maintenance and accessibility of the machine components. Hence, the powerpack and winch house are easily assembled in two modular units. The powerpack, which houses all drive components as well as the drive unit itself, is not only easily accessible, providing ample space for all service activities, but also features a roof that can be opened so that any large components can be serviced safely and easily. The powerpack is designed so that the components are installed in the same position in both the diesel and electric versions, simplifying subsequent service activities. The drive unit itself is available in two versions, as a 563 kW level 5 diesel engine or as an efficient electric motor with an output of 615 kW. With its star undercarriage with 14 wheelsets, the 9300 E remains compact when traveling, while the folding outriggers give it stability in the working position on an outrigger area of 11.5 m x 11.5 m. Overall, the machine features a convincingly simple and robust technical concept for the undercarriage. After all, the reliability and availability of SENNEBOGEN machines are criteria that appeal to customers all over the world.